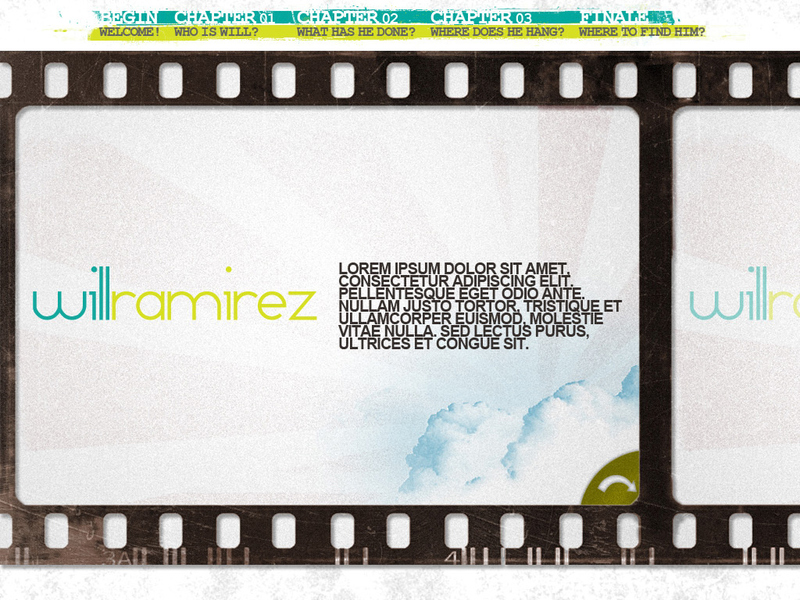 Will Ramirez is a director, videographer, and film editor. As he puts it, “I think in film!” With several successful projects under his belt, Will wanted to create a personal brand in order to share his work and promote his skill set to others in the film industry. While the basics of this were simple enough—create a logo and brand mark, develop a website with links to Will’s social media presence, and design and print business cards—the concept was not. We wanted to put people into Will’s mindset and create an overall Web experience unique to him. 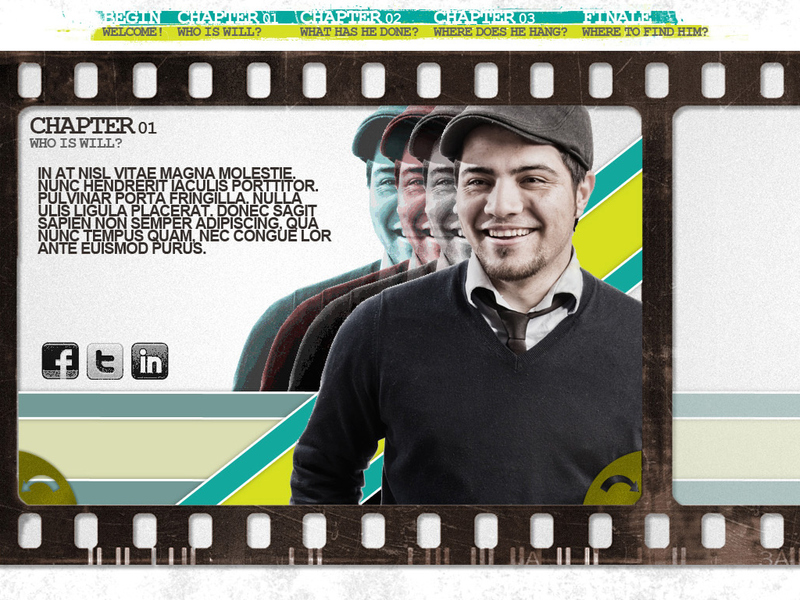 Will Ramirez is a director, videographer, and film editor. As he puts it, "I think in film!" with several successfull projects under his belt, Will wanted to create a personal brand in order to share his work and promote his skill set to others in the film industry. While the basics of this were simple enough - create a logo and brand mark, develop a website with links to Will's social media presence, and design and print business cards - the concept was not. We wanted to put people into Will's mindset and create an overall web experience unique to him. 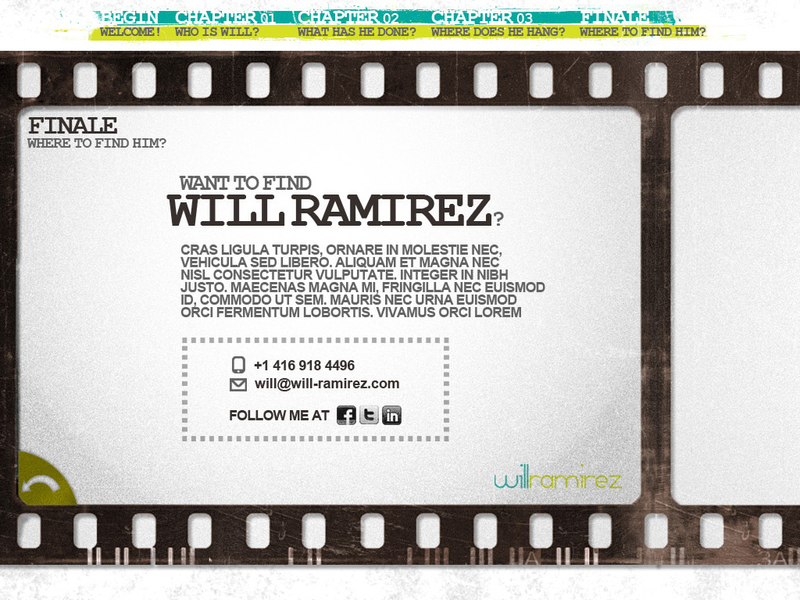 To brand Will Ramirez as a film professional and create an online presence that alloed users to experience Will's unique perspective. The goal was to create an image uniquely for Will himself as a creative professional. The choice of font styles and the two main colours, baby blue and neon green, allows his name to stand out. While the design focuses on presenting his name, which allows him to be any part of his multi-discipline creative profession. Official WR logo in white and dark background. 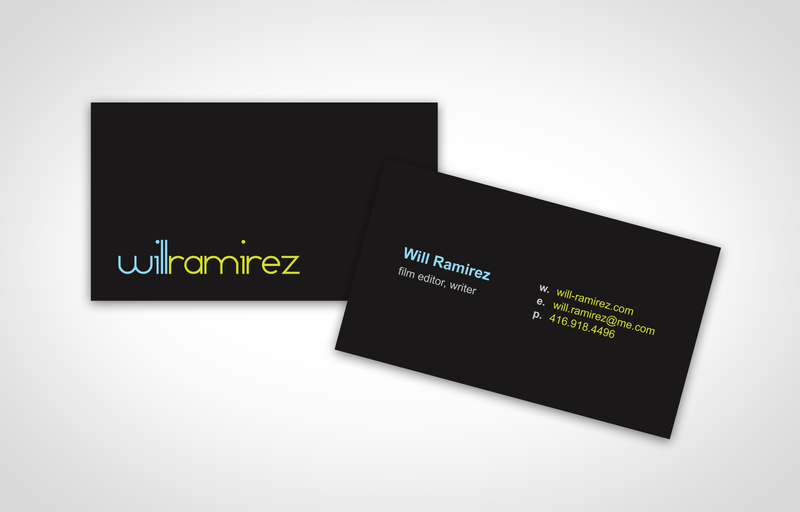 WR business card design - front and back. While thought and planning are always an important part of our process, creating the concept was especially important in this case. We spent a lot of time developing a truly unique idea - something different not only frmo anything we'd ever done but from anything done on the web, period. 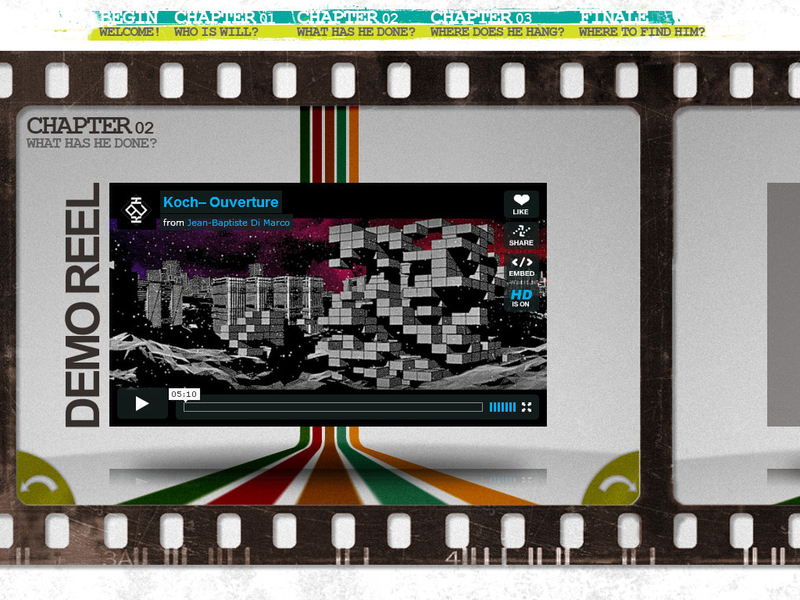 To mimic Will's "film-like" perspective, we created a website that looked and acted like film. 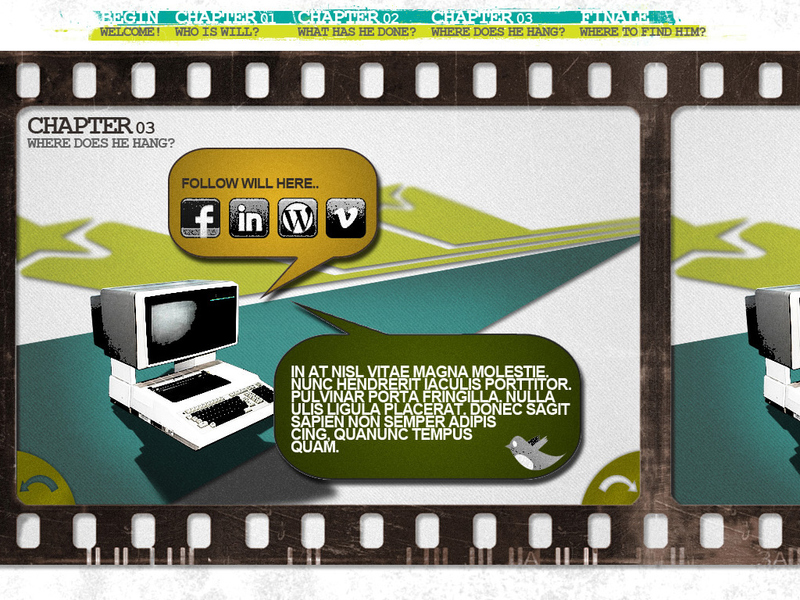 Pages are short and resemble frames of film, and visitors use arrows to move to the next page, scrolling horizontally the way film moves through a projector. Of course, the site is branded with a clean, professional yet colourful and artsy brand mark, and a demo reel allows users to see Will's work. Finally, links to Will's Facebook, Twitter, LinkedIn, and Vimeo accounts, as well as his WordPress blog, allow users to interact with Will more readily, and a special feature even shows his latest tweet. Official website - Landing Page. Official website - About Page. Official website - Demo Reel Page. Official website - Connect Page. Official website - Contact Page. Official website - Splash Page. 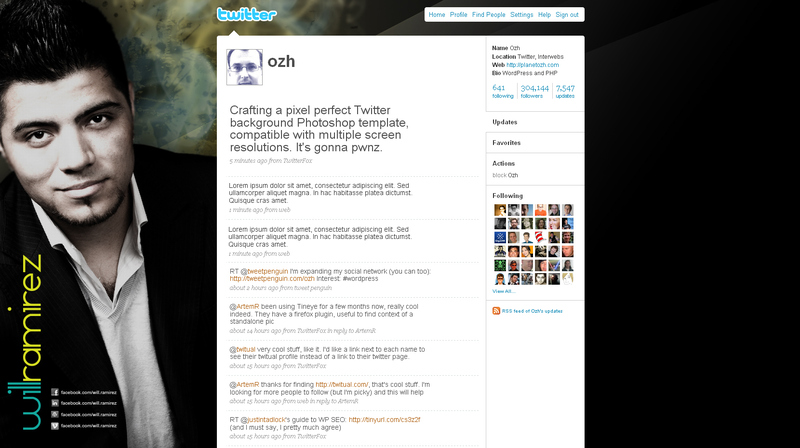 Official Twitter background design ( on a sample Twitter content ).